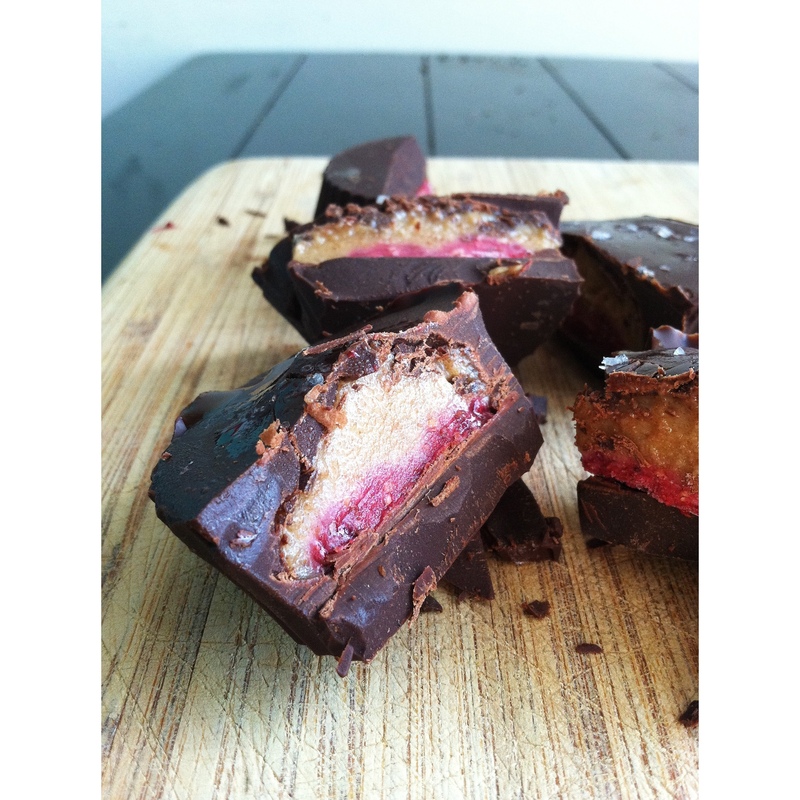 Salted Date Caramel & Raspberry Chia Jam Chocolate Cups. | Eat More Plants. The culmination of many cravings rolled into one little, chocolate cup. Don’t let the complicated name fool you; this is pure perfection, if I say so myself. I planned on making a raw date caramel for my apple pie smoothie but the two never met in passing. I drank my smoothie before I even had a chance to top it. So…I thought, hmm. A nice cool day like this is perfect for working with chocolate. Chocolate cups filled with the date caramel? But I knew I needed some color in there as well. Raspberry chia jam! Don’t skip the salt on these! A little salt makes dark chocolate infinitely better. Chocolate can be a bit tricky at first but by having patience with it, you’ll persevere. 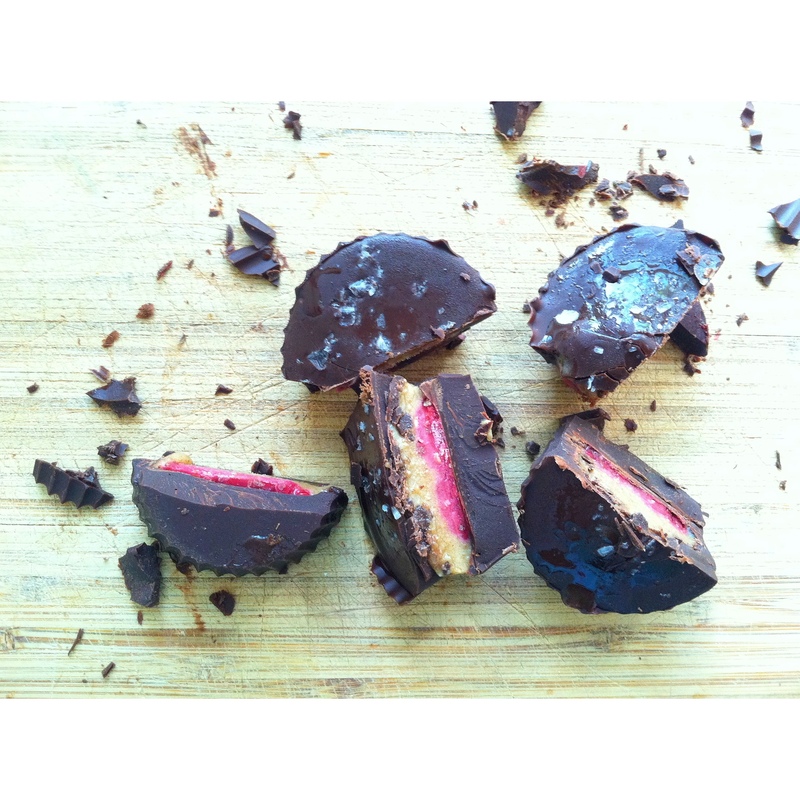 This recipe makes 6-7 chocolate cups. So firstly, make the date caramel. Drain the dates and save the water. Add all ingredients and 1/3 c of the soaking water to your blender. Add more water if it’s too thick or not blending smooth enough. Note: traditionally I make this jam with a few tablespoons of maple syrup but since the date caramel is already a very sweet element, I skip the maple syrup. Blend the raspberries for a minute or two on high speed, if using fresh. For frozen, cook the raspberries over low heat in a saucepan for 5 minutes to soften and evaporate some of the water and then proceed to blend. Pour blended raspberries into a small bowl and mix in chia seeds. Let sit for 10-15 minutes, stirring occasionally, to prevent clumping. Melt 8oz of dark or semi-sweet (or a combination of both) chocolate in a double boiler or in a saucepan over lowest heat possible. Add 1 tablespoon of coconut oil to help keep the chocolate pliable. I use individual silicone cupcake molds to make these. It’s just as easy with paper or foil cupcake liners but make sure you rub the bottom with a little coconut oil to prevent sticking. Pour 2 1/2 tablespoons of chocolate into each cup and tilt the cup to roll it around to coat 1/2 inch up the sides. Place these finished cups in the fridge for 20-30 minutes to set. When 30 minutes has almost passed, melt another 6oz of chocolate with 2 teaspoons of coconut oil. When chocolate is ready to be worked with, remove the cups from the freezer to assemble the filling. 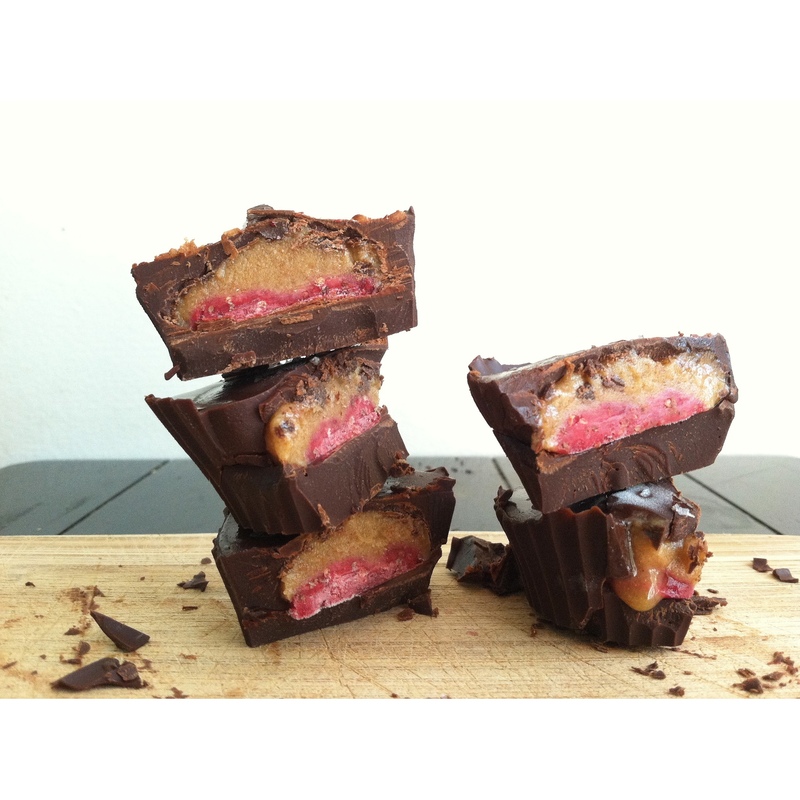 Place 1 tablespoon of jam and 1 tablespoon of caramel in the center of each chocolate cup. No need to smooth it out evenly, it’s better plopped in the middle and not touching the sides. Pour 2 tablespoons of chocolate over the top of each filled cup and tap lightly against the counter to help flatten out and get rid of any air bubbles. I like to let these set up for 10-15 minutes in the freezer and then sprinkle a few flakes of maldon salt on top of each so that they sink slightly in but stay intact. Let freeze for at least an hour before diving into these. If they’ve been sitting in the freezer for a while, I like to let them defrost so the filling softens a little. The raspberry jam tends to get a little too frozen and I like it better gooey.